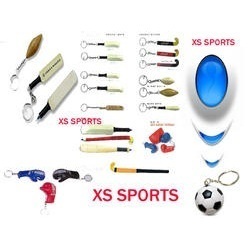 We offer custom made Novelty Keyring Items like small footballs, cricket bats etc in small as well as in bulk numbers. We are the suppliers and these can available to our clients in Chandigarh, Mohali, Panchkula, Haryana, Punjab, Himachal Pradesh or Entire North India. 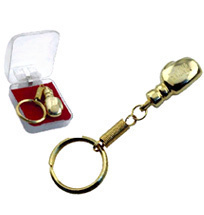 We are engaged in manufacturing, trading and supplying a wide variety of keychain such as novelty keychain. Handicraft on Painted Key Chain. here we present our art of wood key chain, beautiful carving elephant key chain with hand painting work. Metal Key Chains were made of flexible materials and can be cut into hundreds of designs & shapes according to specific need. They can include a custom logo, latterings. Key chains were perfect branding tool for business who gives keys to their customers like cardealerships, rental agencies, real estates, it helps to stay in mind everyday. Personalized unique crystal key chains in different shapes - round, heart and rectangle. We have a large number of designer Key chains in Plastic, metal & mouldeds. We also deal in complementary novelties, table displays, photo frames, wooden architects, Momentos, Clocks, Watches, Caps, Umberllas, Small gifts, Purses, Hand Bags etc.